Matt C: There’s no question, at least in my mind, that this new series won’t be anything other than a temporary excursion for Marvel’s First Family. Anyone who thinks otherwise is either new to the world of superhero comics or is the kind of gullible fool the hype-merchants love to dupe. Johnny Storm will return to the fold sooner or later, but for now Hickman is going for the time-honoured “illusion of change” approach that has buoyed the industry for so many years. And so it’s out with the iconic ‘4’ logo and in with a new set of costumes plus a new addition to the team: Spider-Man. 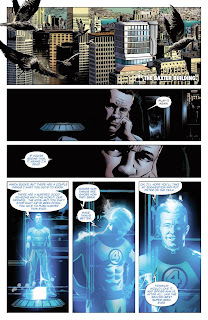 I can understand why some may groan at the wallcrawler’s inclusion, as he’s in danger of becoming as ubiquitous as Wolverine, but for me (considering his long history with the Fantastic Four and his friendship with Johnny) Spidey feels like the right man for the job. He’s certainly a much better fit for this team than he is the Avengers. 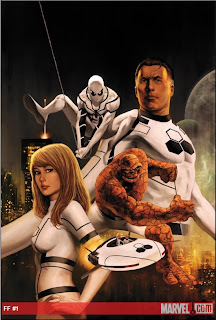 I can imagine some folks will also be groaning at the new costumes, and while they’re not exactly a design I would choose, they make sense with the path Reed and co are currently taking: no longer are they merely superheroic explorers of the unknown; now their remit in their new guise as the Future Foundation is to change the world. Epting’s artwork is generally terrific, his action sequences are exciting and beautifully composed and his framing of the various character interactions is spot on. A few facial expressions are a bit wonky but then you look at the close-ups of the Thing brooding and you really have to let any criticisms go. When Epting nails it, he really nails it. Paul Mounts colours are perfectly suited to Epting’s illustrations: a little darker than sometimes utilized for these characters, but brilliantly effective through the use of shadows and shading.